Oil producers hailed President Trump’s recent call for accelerating construction of the Keystone XL and Dakota Access pipelines. But is there a need for so many major pipeline projects? President Trump signed a memorandum Jan. 24 that gave new life to the Keystone XL Pipeline despite bitter opposition from environmentalists trying to push the world toward cleaner fuels to combat climate change. 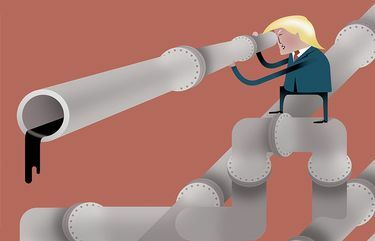 Trump’s embrace of pipelines is welcomed by the oil industry, particularly in Canada, where producers have been buffeted by weak markets, low prices and concerns about the climate risks of expanding production from massive oil-sands deposits. Behind the politics and pushback looms this question: Is there really a need for so many new pipelines? Just two months ago, Prime Minister Justin Trudeau of Canada approved permits for two major pipelines to carry Canada’s oil sands to market. 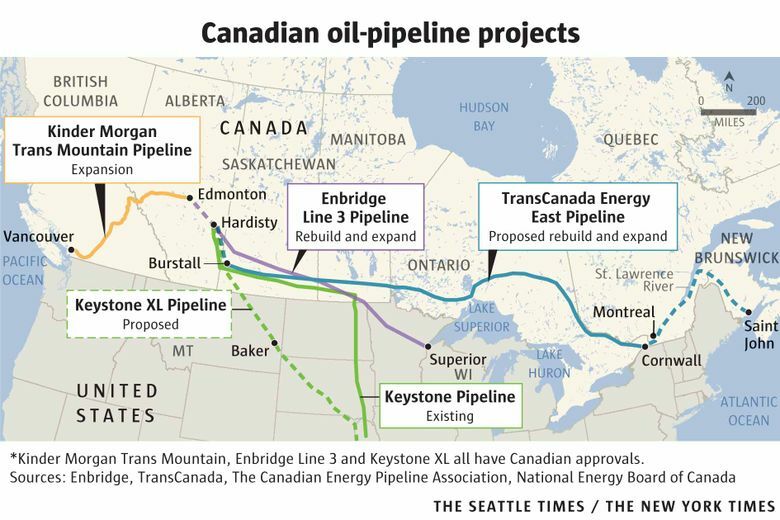 Enbridge Line 3 would replace and expand capacity on a route that already carries crude from Alberta to Wisconsin, while the Trans Mountain Project would bring more oil to a terminal in Burnaby, British Columbia. Another pipeline, Energy East, now pending review by the Canadian government, would carry oil to Atlantic coast markets. If all these projects are completed, the pipeline network could be significantly overbuilt, according to an analysis by Simon Fraser University professor Thomas Gunton. He found that the total pipeline network would have at least 51 percent more capacity in 2025 than is needed to carry Western Canadian oil. Some analysts, however, predict all that extra capacity will help spur more investment in oil sands. That’s exactly what environmentalists fear. They say new investment in oil sands, which have a substantially higher carbon footprint than many conventional crudes, would be bad news for global efforts — agreed upon in the 2016 Paris Conference — to limit the effects of climate change. The Dakota Access Pipeline, or DAPL, similarly piles on excess capacity, he said. There is nowhere near enough oil being produced in the Bakken shale oil region of western North Dakota today to fill it, or any likely near prospect of it, with low oil prices depressing production, he said. 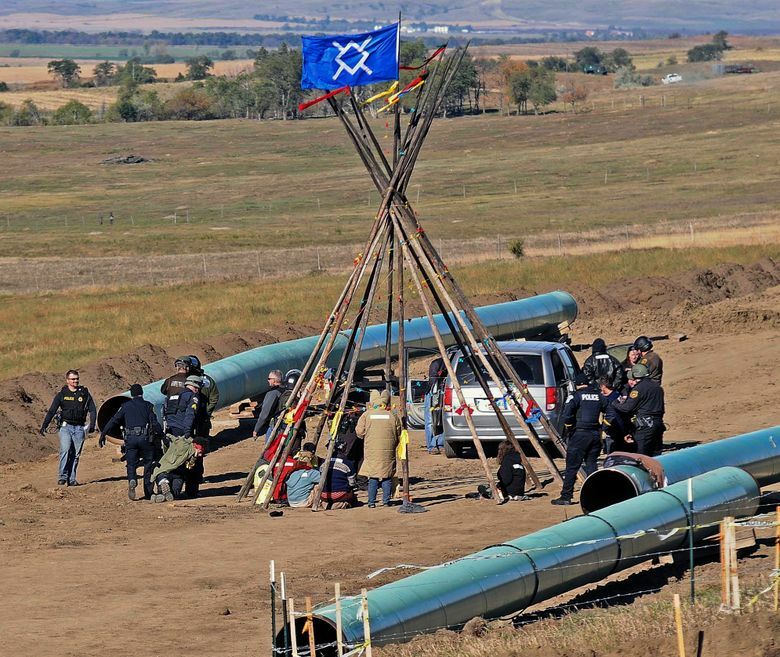 There will be more than 300,000 barrels per day of spare, unused pipeline capacity if DAPL is completed, Derry notes in an analysis for Sightline. Pipeline developers say the projects are lifelines to markets and eagerly sought by the producers. Just two days after Trump signed his memorandum to revive the Keystone XL project, TransCanada, the pipeline developer, filed a new application with the U.S. State Department. Under Trump’s direction, the State Department has 60 days to respond to the application for the project to carry oil from Hardisty, Alberta, to a hub in Steele City, Neb. That’s where Keystone XL joins the existing pipeline network. Keystone XL developers still are expected to face legal challenges and permitting hurdles, including those raised by the state of Nebraska. But the leadership of TransCanada appears eager to move ahead on the 850 miles of U.S. pipeline construction. “Eventually the right thing happens, if you are patient …,” said Russ Girling, chief executive of TransCanada Corp. Meanwhile, backers of the Trans Mountain Pipeline say they plan to start construction as early as September 2017. 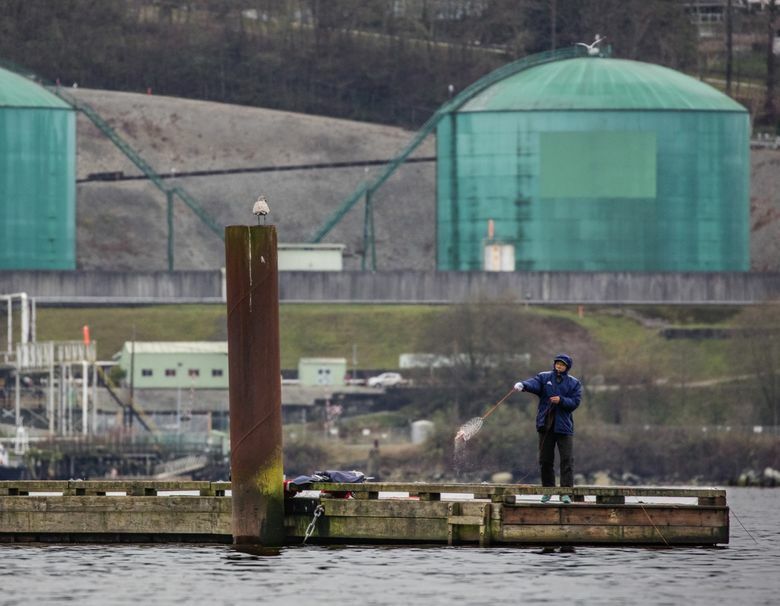 “The demand for the West Coast access that our pipeline will provide is very high,” said Ali Hounsell, a spokeswoman for Kinder Morgan, developer of the Trans Mountain pipeline to bring more oil to British Columbia. More than 700 miles long, the Trans Mountain Pipeline approval was recommended by Canada’s National Energy Board. The project would twin an existing line and provide enough oil to dramatically step up exports to Asia, as well as supplies to West Coast refineries. Tanker traffic would see a sevenfold expansion through the Salish Sea in Washington and British Columbia. The risks of oil spills have spurred tribal and environmental opposition in both Canada and the United States, and the pipeline permit faces legal challenges. Hounsell said Kinder Morgan signed 15- and 20-year contracts with shippers in 2012. Regardless of whether Keystone XL gets back on track, Kinder Morgan will move ahead with the Trans Mountain project. Canada produces conventional crude oil that can flow through new pipelines. But most of the product will be derived from Canadian oil sands, a thick hydrocarbon known as bitumen that either must be refined into a synthetic crude or diluted before being put into a pipeline. Canada produced 1.3 million barrels a day of conventional crude in 2015 and 2.4 million barrels a day of product from oil sands, according to the Canadian Association of Petroleum Producers. Development of new fields — or expansion of old ones — requires major investments that take years to pay off. When oil prices nose-dived in 2014, many projects were put on hold or canceled. “The forecasts for future production have come down by a significant margin,” said Gunton, who is director of a resource and environmental planning program at Simon Fraser University. Gunton says that western Canadian production from oil sands could be further slowed after 2020 by Canadian climate policies that are expected to include federally mandated carbon pricing. This would raise the costs on what is already one of the highest-cost oils in the world to produce. Other analysts agree that new construction of both Keystone and Trans Mountain could create surplus space in the pipeline network. But they note that in recent months there has been a modest uptick in oil prices that has helped restart some oil-sand expansion projects and lifted some of the gloom. If Trump has his way, some of the new pipeline capacity could come online quickly. Trump has called on the U.S. Army Corps of Engineers to either expedite an environmental review of the Dakota Access Pipeline called for by the Obama administration last December, or rescind the order for the review and issue the easement for building the final crossing at the Missouri River. Workers are already standing by in hotel rooms in North Dakota and equipment is on the site to complete the last bit of work. The work could be completed in just two weeks if crews work around the clock, a source close to the project said.